Alongside the latest cardio and strength-training equipment, we have an energetic, supportive team committed to helping you achieve your individual fitness goals. Our certified trainers create personalized fitness programs that help our unique members realize their full potential. With so many options to choose from, you’re certain to find the fitness program that’s right for you--whether you enjoy the camaraderie of working out in a large group or the more personalized attention that comes with small group training and personal training. Lastly, we offer an indoor track for walking or running. Group Fitness classes at WRRFC are offered for all fitness levels and abilities. 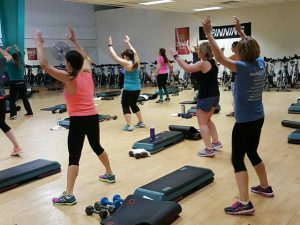 The Group Fitness schedule offers 20 different types of classes, 7 days a week. Each fitness class is led by a certified instructor who also has CPR training. Our objective is to help meet your personal fitness goals with enthusiasm, integrity, and respect. Small Group Fitness Training is a great value for personalized attention in a group of six or less participants. We offer a private room for our small group exercise training to provide a motivating environment. FIT 360 classes are taught by our certified Fitness Professionals nearly every day of the week, with convenient morning and evening times available. 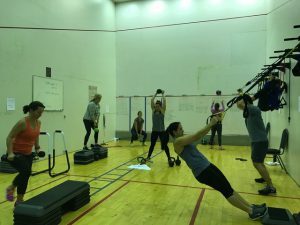 Fit Factory is held on the tennis courts and provides a new twist on small group training. Check out our weekly calendar for class times! Personal training offers the highest level of fitness training for individuals seeking one-on-one assistance. With personal training, there is a concentrated focus on the trainee during the 30 or 60 minute session. Our experienced and knowledgeable Personal Trainers use a wide range of equipment and training methods to help clients meet their individual goals. We have three regulation-size racquetball courts that may be reserved up to one week in advance. Racquetball is included in our Fitness Membership. The sport provides an excellent cardiovascular workout. In just one hour of playing, a player may expend 600 to 1,000 calories! Racquetball also allows for a great upper and lower body workout, as players' must maneuver the court while using their arms and torso to swing the racquet. Fitness enthusiasts are sure to love the challenge this sport offers. Racquets and balls are available for purchase at the club. We also provide loaner racquets for those new to the sport. 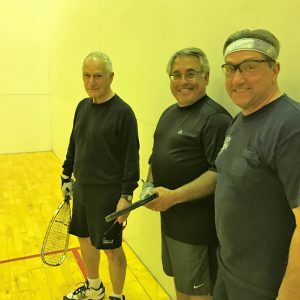 We regularly hold racquetball mixers for players of all abilities to get to know one another. Additionally, we offer pickleball, a game that borrows both its rules and playing field from badminton, and is among the fastest growing sports in America. Pickleball is included in all club memberships and court fees do apply. Courts may be reserved up to one week in advance.